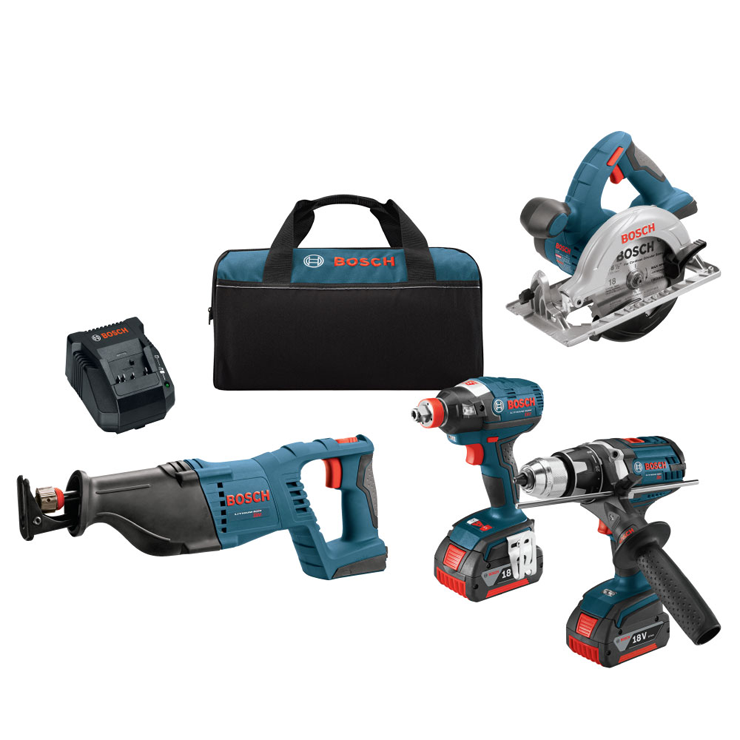 The Bosch CLPK430-181 18V 4-Tool Combo Kit is the one-stop, comprehensive package of cordless driving, drilling and cutting power, all on Bosch's 18V tool platform. This kit includes the IDH182 EC Brushless 1/4 In. and 1/2 In. Two-In-One Bit/Socket Impact Driver, a powerful two-in-one driver that replaces both an impact driver and impact wrench. Its hassle-free EC Brushless motor provides a max of 1,650 In.-Lbs. of torque and up to 3,200 BPM, but it is only 2.4 Lbs. and 6.2 In. long. The DDH181X Brute Tough Drill/Driver handles has 25+1 clutch settings and a variable-speed trigger to make it easy to control. It has KickBack Control to protect against adverse torque reactions. The tool's four-pole open-frame motor drives a maximum of 710 In.-Lbs. of torque. The CRS180 Reciprocating Saw handles tough cuts where other recip saws can't go, and it has a long and efficient 1-1/8 In. stroke, producing more material removal per stroke. The CCS180 6-1/2 In. Circular Saw delivers 3,900 no-load RPM, enabling it to power through 2 In. of tough material like wood and decking. It is, however, a compact 12-1/2 In. in length and only 6.7 Lbs. The kit comes with two 18V 4.0 Ah FatPack batteries that provide outstanding runtime and an 18V charger.